Perhaps your early electronics experience was with communications equipment when vacuum tubes were king. Tubes had personality. They emitted a warm glow from their filaments and cherry-red anodes, and mercury-vapor rectifiers added a blue tint to the drab gray and black equipment. The gentle hum of high-voltage power transformers could put you to sleep. If a current needed "tweaking" you looked at a 3-inch panel meter, and took control with a knob you could get your whole fist around! ...well, maybe. In today's solid-state circuits, nothing glows. Heat is a design "no-no." The only noise might be an anemic whine from a small pancake fan cooling a microprocessor so it won't fry its fragile brain. We measure currents with milli-ohm resistors, and adjust them with transistors. If there are knobs, they are so small that your fingers cramp trying to get hold of them. Yet there is one common thread: when modern circuits need power resistors, the choice is often wirewound. Today's wire-wound resistors are rugged and reliable. They are small and compatible with modern PC-board and surface mount manufacturing systems. And, new technology resistors still fall short of wire-wounds. Look at the chart: athough metal foil technology is a close second to wirewounds, other technologies are generally unable to measure up in power rating, tolerance and TCR. Surge current capability and stability are other important specifications often not found in data sheets. Wirewounds have 2 to 5 times the surge current capability of film products. Stability is hard to define, but wirewounds may be from 10 to 100 times more stable. 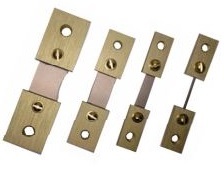 Most experienced users agree that wire-wounds are superior in these characteristics. So, wirewound power resistors don't take a back seat in today's electronic technology. Although they won't heat the "shack" today, they still do the best job in many contemporary applications.